Differences in perspective shape the way we see the world. Toddlers see nothing but joy in a mud puddle, while parents see piles of undone, badly stained laundry. The sheer cliff face that screams adventure to a climber instills sheer panic in others. Such differences plague the relationship between scientists and policymakers, making it difficult for them to connect in meaningful ways. We repeatedly hear from national and international groups (like the 2002 World Summit on Sustainable Development or the 2004 U.S. Commission on Ocean Policy) that the oceans are in trouble and that we need science to help. But engaging scientists and policymakers in conversations that can seed science-based solutions for ocean policy turns out to be far more difficult. 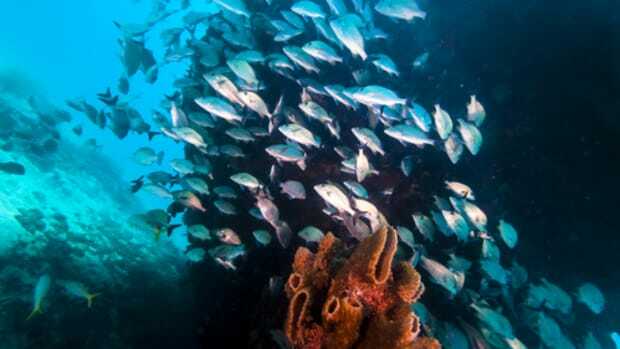 In 2008, COMPASS and Stanford Law School’s Environmental and Natural Resources Law and Policy Program brought together a small group of scientists and policy experts to begin a dialogue about science-based solutions for the health of ocean ecosystems. POLICY EXPERT: As a scientist, you have dedicated your life to understanding how the ocean is changing and why, so I’m sure you can answer this: If ecosystem health is so important, what does that mean and how do we measure it? SCIENTIST: I’ve never thought about it that way, and frankly, that hurts my brain. POLICY EXPERT: OK. While you’re exercising your brain muscles, we’ll have to make up some answers and move on without your input. And then the flip side. SCIENTIST: Imagine that we scientists could agree on what 10 measures of ocean health might be. How would you lawyers build those into new federal policy? Would these measures supersede existing water quality standards or fisheries management? POLICY EXPERT: Admittedly that’s not quite as ironed out as we’d like, either. This conversation highlighted a recurrent theme at the interface of science and policy. Our perspectives are often so different that we might as well be from Mars and Venus. It took some serious effort to bridge the gap between the two planets on the important issue of ocean health. As we described briefly last month, this 2008 workshop gave rise to the working group sponsored by the National Center for Ecological Analysis and Synthesis, which then combined forces with the Ocean Health Index project founded by Conservation International, the New England Aquarium and the National Geographic Society. We also formed and engaged a policy advisory committee with the explicit intent of keeping the ‘Venutian’ perspective front and center in our efforts to develop and implement the Ocean Health Index. Ocean health means different things to different people, and current assessments of ocean health focus predominantly on the state of the natural environment. So how are we designing the Ocean Health Index to narrow the distance between science and policy? Let’s dig a little deeper into the sources of tension. Scientists desire precision, thrive on complexity and nuance, and on the whole are an incredibly precautionary bunch. We will much more readily tell you what we don’t know rather than dare admit that we actually know something. We are happy to share our perspective but not our opinions. We’re driven by a passion for discovery and satisfaction of our own curiosity. Policymakers desire simplicity, and by necessity must be incredible generalists. For example, members of U.S. Congress must make decisions about everything from public health to funding for the military to cybersecurity to whether or not to raise the debt ceiling. In the midst of all of that, we’re trying to get their attention about the ocean. They thrive on opinion and are driven by the needs to make very specific decisions and satisfy their constituents. We are designing the Ocean Health Index to take the pulse of the ocean, to provide a set of vital signs that will help managers, policymakers and the public quickly diagnose where problems lie and identify possible solutions. One of the most crucial decisions we made at the outset of this project was how to define health. We are not defining healthy as pristine, free from the influence of people. An index of ‘pristineness’ would have no relevance to policy, since ocean policy is made for the people, by the people. The ocean and people are inextricably linked, from sustenance to jobs to spiritual connections; people use, influence, or value every corner of the world’s oceans. Based on our conversations thus far, this decision to recognize human dimensions is popular with our Venutian colleagues as it makes our science relevant. It has been somewhat less popular with more conservation-oriented colleagues who equate healthy with pristine. By measuring health through the lens of benefits to people, we include both conservation and sustainable-use values. The things the public desires from the ocean (and thus our public policy goals) are incredibly diverse. They include food security (seafood is the primary source of protein for more than 1 billion people); bountiful possibilities for recreation and tourism; diverse livelihoods, cultures and traditions; thriving coastal economies; coastal habitats that store carbon and protect coastlines from flooding and erosion; subsistence opportunities for billions of people; rich biodiversity; and clean waters and beaches. The Ocean Health Index will track the ability of the ocean to provide this spectrum of benefits to people, both now and in the future. We recognize that people have very different ideas of what a healthy ocean should look like. For some, the most important pieces might be diverse habitats, iconic species and clean beaches. Others would emphasize healthy fisheries and coastal livelihoods. In a future installment of this series, we will describe how we will deal with those differences, as transparently and thoughtfully as we can. Speaking of the future, a key piece of our definition of ocean health is the emphasis on sustainability, with a focus on both current and future health. The Ocean Health Index will estimate whether things are likely to be getting better or worse in the future. One of the biggest challenges we face in public policy (in oceans and elsewhere) is how to balance short-term needs with ensuring that the ecosystem will be able to continue to provide benefits to future generations. For example, we could harvest a species to extinction and get lots of short-term profit, but this comes at great long-term cost to food security for future generations. The Ocean Health Index will provide a new tool for policymakers to address a pivotal question: Is the ocean more or less likely to be able to continue to provide the spectrum of benefits my constituents want and need? How we make operational this concept of sustainability will be the focus of a future piece. The final design feature of the Ocean Health Index intended to maximize its relevance to policy is its flexibility. It is a framework that can be used to assess the health of an individual estuary or a larger region, like the U.S. West Coast, to the exclusive economic zone of an entire country, to the entire globe. It can be used in places where we know a lot as well as those where we know very little, in places with lots of people or fewer, and in tropical, temperate and polar regions. We are currently calculating a unique value of the index for the coastal waters of every country in the world and within three initial and more detailed case studies: the U.S. West Coast, the Mid-Atlantic Bight of the United States’ Northeast Shelf, and Fiji’s exclusive economic zone. We’ve made a number of deliberate choices to create an Ocean Health Index that will be relevant and useful to policymakers. We’re fully aware that the cultural divides between science and policy will always persist. But if we actually want to develop science with an eye to informing what’s happening in the real world, it’s in our best interest, as scientists from Mars, to do our best to understand what life is like on Venus.